↑ Sam Dagher (18 September 2007). "In the 'Venice of the East,' a history of diversity". The Christian Science Monitor. สืบค้นเมื่อ 2 January 2014. ↑ "Iraqi parliament recognizes Basra as economic capital". ↑ "Basra". สารานุกรมบริตานิกา ค.ศ. 1911. 3 (11 ed.). 1911. p. 489. ↑ "Population of capital city and cities of 100,000 or more inhabitants". Demographic Yearbook 1955. New York: Statistical Office of the United Nations. ↑ "National Intelligence Survey. Iraq. Section 41, Population" (PDF). CIA. 1960. ↑ "Steven Vincent". Committee to Protect Journalists. 2005. ↑ "UK soldiers 'freed from militia'". BBC. 20 September 2005. สืบค้นเมื่อ 17 March 2012. ↑ "British smash jail walls to free 2 arrested soldiers". San Francisco Gate. 20 September 2005. สืบค้นเมื่อ 17 March 2012. ↑ "UK troops return Basra to Iraqis". BBC News. 16 December 2007. สืบค้นเมื่อ 1 January 2010. ↑ "Climate: Basra - Climate graph, Temperature graph, Climate table". Climate-Data.org. สืบค้นเมื่อ 22 August 2013. 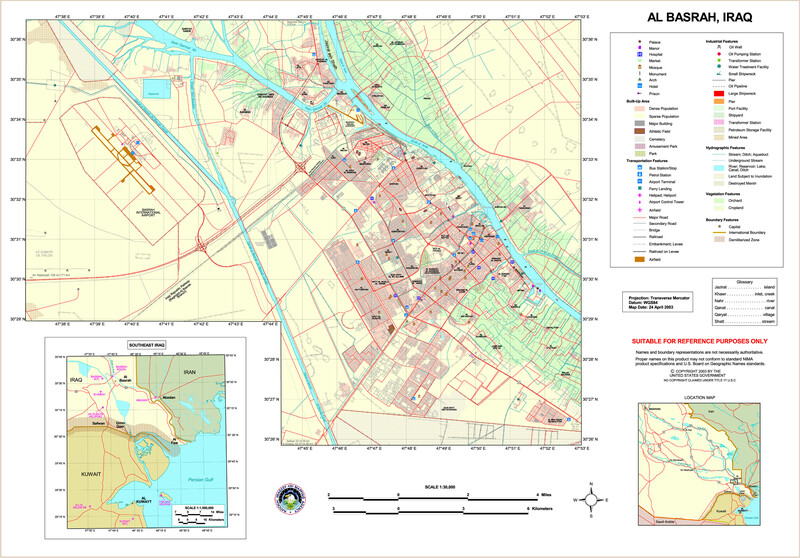 ↑ "Basra Climate and Weather Averages, Iraq". Weather2Travel. สืบค้นเมื่อ 22 August 2013. "Basra". สารานุกรมบริตานิกา ค.ศ. 1911. 3 (11 ed.). 1911. หน้านี้แก้ไขล่าสุดเมื่อวันที่ 10 ธันวาคม 2560 เวลา 01:42 น.